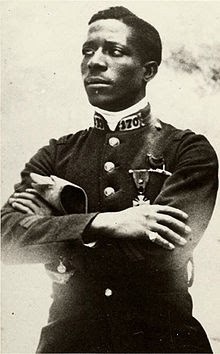 Another WW1 story you might not have heard, that of Eugene Bullard, a young black man who found freedom and respect far from his homeland. I'd never heard of him until recently and found there are heaps of parallels between his life and that of Mathew Henson, a hero abroad but ignored in his native land. Bullard became the first ever black military pilot in 1916 and won the Croix de Guerre, but ended his life working as a lift operator in the Rockefeller Center. Eugene Bullard stowed away on a ship and ended up in Aberdeen. He said he witnessed his father's narrow escape from a lynching. He made his way to Glasgow and worked there for a while. Life outside segregated America held a whole load more opportunities for a young black man and he settled in Paris in 1913 and worked as a prize fighter and sometimes in the music hall. He enlisted in 1914 on the outbreak of war and joined the French Foreign Legion. 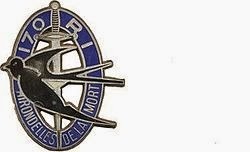 His unit, the 170th Line Infantry Regiment were known poetically as L'Hirondelles de la Mort, the swallows of death. Seriously wounded at Verdun he joined the French Air Force and went first on gunner training and then as a pilot. He flew with other American pilots in the Lafayette Flying corps and shot down at least one German plane, eventually promoted to the rank of Corporal. When the Americans joined the war they organised for American pilots in the Lafayette Corps to transfer to the USA Air Force. Bullard, naturally, was refused on account of his colour. Bullard had a row with a French officer and was punished by demotion to the infantry. He continued to serve in the 170th until the end of the war, his nom de guerre was The Black Swallow. Bullard stayed in France owned his own nightclub, married a wealthy woman and was part of Jazz Age Paris, his friends included Josephine Baker, Langston Hughes and Louis Armstrong. He joined up again for WW2, but was seriously injured and fled to the States. However life for a black man in America was hard, he was no longer the celebrated flier and nightclub owner, he found work as a security guard and sometime interpreter for Louis Armstrong. He suffered too in the Peeskill Riots in 1949, when a Paul Robeson concert was attacked by anti communist American veterans. Bullard was one of the victims, his attackers included Law Enforcement officers and even though the attack was filmed no one was ever bought to justice. Bullard was not forgotten in France. In 1954 he was invited to rekindle the flame that was lit on the Tomb of the Unknown Warrior and in 1959 he was awarded the Legion d'Honneur. Bullard died in 1961 of cancer but it wasn't until he was dead that the USA recognised his achievement; he was posthumously awarded the rank of Second Lieutenant in the USA Air Force. What a fantastic photograph - and such an interesting story. Would love to know more about this man. And what exactly was the Lafayette Flying corps? As far as I can gather they were foreign born - mostly American - pilots. His life as a Club owner in between the wars sounds incredible, his nightclub was world famous. Amazing story - very interesting. I believe the Black troops who served in the US Army were also not allowed in the victory parade, and were often faced with race riots when they returned home. One typo - I think you mean Josephine, not Jacqueline Baker. Wow, this is fascinating, Catherine. What a varied career he had. I wonder how he felt about the discrimination he ran into; clearly he was man of great talent. He must have felt angry and frustrated. Has there been a film of his life? It might make a fine one. Doh yes Josephine! Will edit when I am back at my desk. I am nothing without an editor. Paris in the 20s must have been incredible.